Full-body paint completes the exterior of the Dynamax Grand Sport GT, with color schemes that include Mocha. 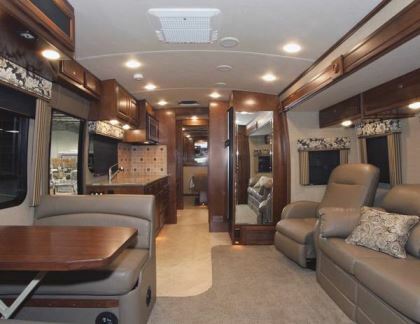 The Super C class of motorhomes can make a nice alternative to bus-style Type A motorhomes. A Super C utilizes heavy-duty diesel-powered chassis from the medium- or heavy-duty truck category. This gives the Super C greater cargo capacity, increased towing capability, and enhanced road handling in comparison to a typical Type A. Dynamax, a division of Forest River, offers a complete line of Super C motorhomes, with a reputation for quality workmanship and innovative engineering. Dynamax’s Super C options range from entry-level units built on Freightliner’s medium-duty M2 chassis, with floor plans beginning at 30 feet long, up through 45-foot tandem-axle coaches utilizing Freightliner’s heavy-duty tandem-axle Cascadia chassis. For this review, we’ll cover a 40-foot Grand Sport GT, which is built on the latter. The Cascadia chassis is commonly used for heavy-duty 18-wheelers. 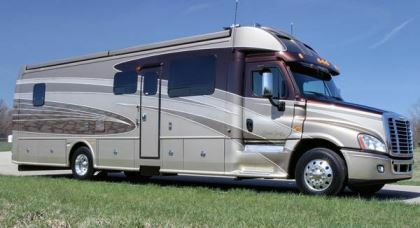 Dynamax custom orders this chassis to meet its motorhome specifications. A 15-liter Cummins ISX diesel engine provides 525 horsepower and 1,850 pound-feet of torque. The unit is ordered with a heavy-duty cooling system that will allow the engine to be chipped to 600 horsepower if desired. An Allison 4000 TRV six-speed automatic transmission passes the power to the 23,000-pound-rated R-series Quiet Ride rear axle. Dynamax also specifies increased insulation in the engine compartment and firewall areas and 60mm Bilstein shocks to create a smooth yet stable ride. The smoothness is afforded by the Taperleaf front suspension and Airliner rear suspension. The Grand Sport comes standard with a 20,000-pound-rated trailer hitch, but my test coach was equipped with the optional 40,000-pound height-adjustable hitch, which includes air brake connections at the rear of the coach. A pair of saddle-mounted fuel tanks gives the Grand Sport 140 gallons of fuel capacity. Both the fuel tanks and the 13-gallon driver’s-side DEF tank are hidden behind attractive fiberglass enclosures. The cab is a driver’s dream. The instrument panel is filled with every possible gauge, and all controls are easily accessible. Overhead LED cab and map lighting can be switched on as white or red, for nighttime driving. A fog-line mirror is included over the passenger’s door, which allows the driver to see how close to the edge of the road the wheels are. The Grand Sport GT incorporates a 4-inch heavy-duty E-coated steel subfloor, which is laid on top of the chassis rails. The dipping process ensures that both the inside and outside of the steel tubes are covered and protected against corrosion. Urethane isolators separate the subfloor from the chassis to minimize vibration noise entering the living area and provide a quiet drive. The sidewalls are framed in 1 1/2-inch aluminum structural tubing, which is jig-welded. Foam insulation and fiberglass siding are vacuum-laminated to create both the wall and roof structures; plus, they are radiused to provide a sleek, attractive appearance. A steel-framed B pillar ties the body and cab together, and additional steel framing connects the body to the cab windshield post for additional strength and safety. Contoured, flush-mounted, deep-tinted windows are boxed in with aluminum tubing to prevent any possibility of rot, which can happen with the wood pieces that many manufacturers use in this area. Dynamax designers employ HWH hydraulic slideouts and leveling systems. The sturdy basement compartments are constructed with E-coated steel for durability. Components such as batteries, the 8-kw Onan generator, electrical accessories, and the utility bay all are located on the driver side to maximize storage space on the passenger side, which is more convenient for user access. A pass-through storage bay for longer items is located in the rearmost compartment. A 3,000-watt true sine wave inverter, automatic generator start system, 50-amp power cord reel, and three massive 8D Lifeline AGM batteries ensure that plenty of power is available to operate the Grand Sport’s electrical systems. Dynamax designers frequently oversize what is required; one example is the use of dual 40,000-Btu and 20,000-Btu propane furnaces. An optional Aqua-Hot hydronic heating system is also available. Cooling needs are met by a pair of 15,000-Btu low-profile air conditioners, and units with heat pumps can be added as an option. The Grand Sport is equipped with a huge trunk recessed in the rear fiberglass cap, which can be used to store towing gear or anything bulky, such as patio furniture. This area also is equipped with lighting and electrical outlets. An optional freezer or exterior LP-gas grill can also be ordered for this trunk. Six bright docking lights are placed in the rear cap to light up the night should you need to hook up a towed vehicle or trailer after dark. The Grand Sport test coach was equipped with keyless entry, an illuminated grab handle, window awnings, rearview and side-view cameras, and all of the other features and amenities one might expect in a coach of this caliber. As for the exterior, Dynamax does not use decals. Logos or branding are painted onto the coach before the clear coat is added; this prevents fading and offers an attractive appearance. The Grand Sport is offered in two trim packages. The Standard Trim Package includes a wall-mounted 21-foot Girard power awning, LED taillights, and a stainless-steel rock guard. My test coach, featuring Mocha exterior décor, was equipped with the upscale Ultra Trim Package. This includes Zip Dee power awnings in the upper fascia for a sleek, aerodynamic appearance. The sculpted front cap has been recontoured to blend into the raised roof rails. The sun visor is painted to match the body color, and the LED taillights have been upgraded to quad lights. For those who desire driver’s-side awnings, Zip Dee power awnings can be added. 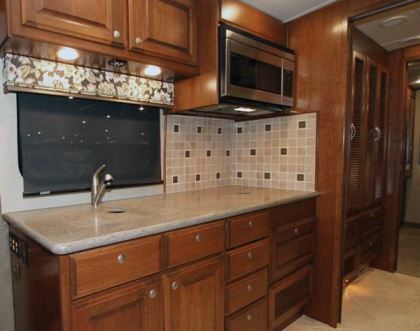 The quality and attention to detail built into every Grand Sport motorhome continues inside. Our coach was completed with the Cappuccino interior décor, including Solid Bark seats and Early American cherry cabinetry. Hardwood flooring is standard in the Grand Sport, but this unit was equipped with optional ceramic tile. All woodwork is solid hardwood and available in mahogany or several tones of cherry. Raised-panel doors and cabinetry are dovetailed to create precise fits and ensure longevity, and posi-lock latches are utilized. A simple press of the button secures the door and prevents it from opening during travel. Multiplex wiring switch panels are located in various convenient locations, including “All Off” programmed buttons in the bedroom, the entry door area, and the cockpit. The galley is fitted with Corian countertops, backsplashes, and sink covers that conceal the dual-bowl sink. An electric two-burner glass cooktop and convection-microwave oven handle the cooking tasks. The “Dream Dinette” features a hardwood table that effortlessly lowers to allow the comfortable Lexington innerspring booth seats to convert into additional sleeping space. A Norcold 10-cubic-foot stainless-steel refrigerator is standard, but an optional 12-cubic-foot refrigerator is available as well. The living space in my test coach was outfitted with a Lexington Magic Bed sofa. For additional seating, the two captain’s chairs can be rotated rearward. The deluxe padded ceiling is equipped with recessed halogen lighting and a Fan-Tastic Vent fan with rain sensor and remote control. A 32-inch LED TV, in-motion satellite dome, and Sony Blu-ray home theater surround-sound system create an excellent entertainment setup. The split bath is furnished with a Corian lavatory top with integrated sink, a one-piece fiberglass shower with skylight, a Fan-Tastic Vent fan, and a hardwood medicine cabinet. A china bowl macerator toilet features two-stage flushing to ensure adequate waste removal. Two large linen closets are standard; one closet is prepped for a washer-dryer, which can be added at any time. The bedroom was equipped with a 32-inch LED TV and an optional Bose integrated sound system. Hardwood wardrobes were located opposite the foot of the queen-size Dream Lounge bed. Optional deluxe sculpted carpet provided a warm floor in the bedroom area. Back up front, the cockpit area included a GPS navigation system, a brake controller, and side-view cameras, all optional, plus a digital alarm clock. The many controls for accessories were conveniently placed within easy reach in the instrument panel. Comfortable Ultraleather driver and copilot seats are mounted on Bostrom air-ride pedestals to absorb shocks and jolts, and automatically adjust to the person’s weight. Driving the Grand Sport was a real treat. I’m used to piloting Type A bus-style chassis, in which the driver sits forward of the front axle. The extended hood and front axle of the Grand Sport gave me more of a feeling that I was driving a large SUV. The Cummins ISX engine moved the coach effortlessly through the gears, and I noticed that it was shifting at lower rpm than I’ve seen in other coaches. The lower revs, plus the additional insulation that Dynamax adds, kept the engine noise down to a comfortable level. I expected the engine noise to be more like other front-engine motorhomes I’ve driven, but I was pleasantly surprised that the Grand Sport was so quiet. Handling was crisp and responsive, but it did not compromise the ride quality. The motorhome’s large shocks absorbed road bumps with ease, resulting in a smooth ride. The cockpit seats were super comfortable. The air-ride pedestals permit the occupant to adjust the seat to his or her weight simply by pressing a lever. Whenever a dip or bump is encountered, the air-ride pedestal allows the seat to move vertically like a big soft shock absorber to dampen the jolt. With the comfortable cockpit seating, suspension, and visibility, the driver should be able to pilot this coach all day without getting tired. The traditional chassis design plus Dynamax’s upgrades enhance handling and driving comfort. The shape of the cab improves aerodynamics and reduces wind resistance, which lets the Grand Sport slip through the wind quietly and with ease. The rounded edges of the transfer fairing that connects the cab to the body contribute to improved fuel economy while making a very attractive coach. While we didn’t have enough time to do an accurate assessment of fuel economy, company officials noted that owners report an average of 10 to 12 mpg. The Dynamax Grand Sport GC400GT carries a base suggested retail price of $467,456.80. My test unit came to $502,179.95 with the following options: Mocha (tan) exterior; Cappuccino interior with Solid Bark seats; Early American cherry cabinetry; dual 15,000-Btu air conditioners with heat pumps; global positioning system; in-motion satellite dome; rearview and two side cameras; Bose integrated sound system in bedroom; Zip Dee roof-mounted power awning; ceramic tile; 40,000-pound hitch; brake controller; three 8D AGM batteries. Dynamax designers are uncompromising in their construction and design, and the attention to detail really makes the difference in product quality. If you are looking for a well-built and well-appointed motorhome with plenty of power and towing capacity, plus respectable fuel economy, the Dynamax Grand Sport is worth serious consideration.